Micro.mini pro by Beautyblender. Micro.mini is a smaller version of the popular cosmetic sponge. It allows for more precise application of products. It's great for applying concealers in the eye area and other hardly accessible areas. Additionally, Micro.mini can be used for applying creamy bronzer, highlighter, eyeshadow or blush, which will facilitate daily make-up. In combination with foundation it provides silky and naturally looking complexion. It makes the cosmetics blend with the skin, does not create streaks and stains. 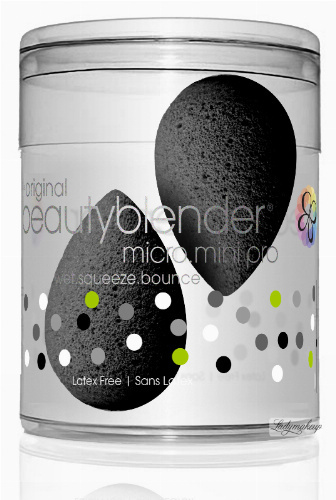 Using Beautyblender micro.mini, it is not possible to achieve a mask effect because it is designed for applying the right amount of product to the face. This gives enormous savings and convenience. It has a soft and flexible structure. Allows you to create High Definition (HD) make-up. In addition, this product reduces the appearance of wrinkles and discolorations. The elliptical shape helps to perfectly smooth and evenly cover all parts of the face. Provides an airbrush effect. 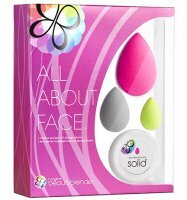 The product is placed in a plastic box that is ideal for storing and drying Beautyblender. Hypoallergenic. Does not contain latex or smell. 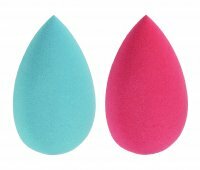 DIRECTIONS FOR USE: Soak Beautyblender in cold water, then carefully squeeze and drain in a paper towel. 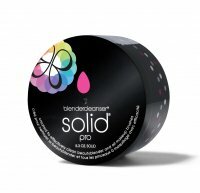 Apply cosmetics (primer, concealer, blush in cream) to Beautyblender. Then press the sponge on the desired skin part you want to cover. CLEANING: Dampen the sponge with lukewarm water and apply a few drops of washing liquid to it. Gently rub it into the sponge until you get foam. Massage and squeeze with your fingers and then rinse with lukewarm water. Repeat if necessary. After rinsing the sponge, leave it in a drafty place (away from direct sources of heat).